This is one that actually ties into sleep too, but for development, our children need appropriate stimulation. What does this mean? It means our babies need to be stimulated with sense that are appropriate for them which includes lots and lots of touch (lots of reasons why touch is so important and a review can be read here ), time outdoors in nature, witnessing human interactions, music, and the chance to just go about the world as a parent does with lots of close contact to help baby feel secure (for a review of these, see ). This also means a reduction in stimuli that negatively affects development which includes electronics, screen time, loud noises, pollution, gadgets that distract instead of engage (think of most baby toys) and so on. When our babies get the right stimulation, they learn and they develop. This also helps them sleep as babies who are understimulated with the right types of stimuli will struggle to sleep. 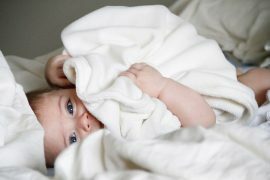 Infants are supposed to wake regularly at night. Even at 12 months of age, many babies are waking regularly. Often babies will feed at night and feed more than many parents expect and this is 100% normal . “Sleeping through the night” was never 12 hours uninterrupted, but rather a period from midnight to 5am – quite different from what we expect today. Even if you think your baby is sleeping through the night, he or she probably isn’t. Parental reports of sleep and objective measures like actigraphy don’t overlap very well with most babies waking far more than parents realize, even if they don’t signal to their parents . 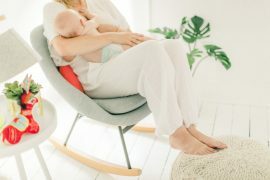 The light stage of sleep is what is associated with learning and consolidation of information which means that your baby who is sleeping lightly and waking regularly is doing all that learning you’re afraid she might be missing. What do you do when you find yourself panicking about sleep? I recommend that you first take a deep breath and look at your baby. Does he seem tired? Is she always cranky and fussy? 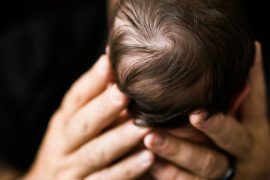 Even if a baby has dark circles under the eyes, this isn’t necessarily a sign of tiredness as this is more common in babies anyway, even without sleep deprivation. Look for behavioural signs of sleep deprivation, but if your baby is generally cheerful (they aren’t cheerful all the time), is meeting milestones, and is eating well, then you don’t need to worry about the type of severe sleep deprivation that we worry about. However, some babies may not be sleep deprived yet, but are sleeping fitfully and don’t meet what we would call “normal”. This is when it’s time to look at the causes such as dietary issues, medical problems (e.g., sleep apnea), inappropriate routines or schedules, and so on. Getting help to figure out the underlying cause is highly recommended, but this can be undertaken without a sense of dread, fear, or urgency. Just because your baby may not be sleep deprived doesn’t mean there won’t be things you want to work on to help the entire family. Where concern may come in is when it is you who needs more sleep. This is where most families find themselves, but have somehow come to the conclusion that baby must need more sleep too. In these cases, I recommend working with someone to come up with ways to help your sleep. 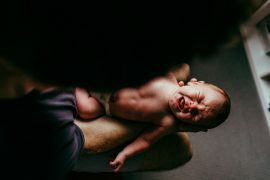 Finding a middle ground between being exhausted and putting the onus of change on your baby is exactly the type of help that most parents need. In their tired state they don’t see the options that are available to them so finding someone to help there is essential. 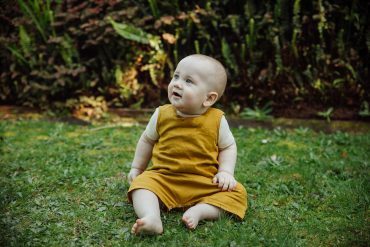 Even when change does involve baby, it can be done gently and over time which allows your child to adapt in a healthy way. Remember: Sleep is important, but it’s not the most important. If you find yourself feeling frantic over your child’s sleep, please take a step back and ask yourself what you really want for your child. Look at all the things you do provide and then breathe a sigh of relief. 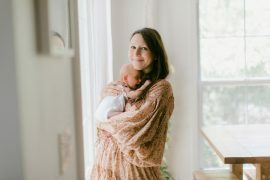 After that, you can think about the steps you would like to take (if any) while respecting those greater priorities of love and attachment for your baby. Benoit D. Infant-parent attachment: definition, types, antecedents, measurement and outcome. Pediatrics & Child Health 2004; 9: 541-5. Moullin S, Waldfogel J, Washbrook E. Baby bonds: parenting, attachment, and a secure base for children. Sutton Trust Report 2014. Fein SB, Falci CD. Infant formula preparation, handling, and related practices in the United States. Journal of the American Dietetic Association 1999; 99: 1234-40. Field T. Touch. Cambridge, MA; MIT Press, 2001. Douglas P. The Discontented Little Baby Book. Queensland, Australia: University of Queensland Press, 2014. Weinraub M, Bender RH, Friedman SL, Susman EJ, Knoke B, et al. Patterns of developmental change in infants’ nighttime sleep awakenings from 6 through 36 months of age. Developmental Psychology 2012; 48: 1511-28. Goodlin-Jones BL, Burnham MM, Gaylor EE, Anders TF. Night waking, sleep-wake organization, and self-soothing in the first year of life. Journal of Developmental and Behavioural Pediatrics 2001; 22: 226-33. Armstrong KL, Quinn RA, Dadds MR. The sleep patterns of normal children. The Medical Journal of Australia 1994; 161: 202-6. Hall WA, Hutton E, Brant RF, Collet JP, Gregg K, et al. A randomized controlled trial of an intervention for infants’ behavioral sleep problems. BMC Pediatrics 2015; 15: 181. Gradisar M, Jackson K, Spurrier NJ, Gibson J, Whitham J, et al. 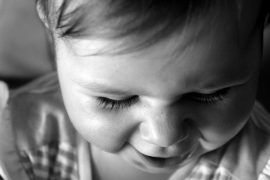 Behavioral interventions for infant sleep problems: a randomized controlled trial. Pediatrics 2016; 137: e20151486. Originally published on Evolutionary Parenting. Tracy Cassels, PhD is the founder of Evolutionary Parenting and the Program Director for Reaching for Rainbows, a non-profit in Prince Edward County, ON, dedicated to helping vulnerable and at-risk young girls through a focus on social and emotional development. She obtained her B.A. in Cognitive Science from the University of California, Berkeley, an M.A. in Clinical Psychology from the University of British Columbia, and her Ph.D. in Developmental Psychology, also at the University of British Columbia.